Mr Assadollah Farshad is the Deputy to the Managing Director who is also the President of the Board of Directors of Alloy Steel Co. He is a qualified engineer in metallurgy and holds an MBA as well. The following is an article that he has written specially for EVENTS, an informative article written in an informal tone. I would like to begin this article by congratulating the Events group of colleagues on publishing such an excellent magazine. I particularly like the title because it sounds right to the ear and it fits most of the subjects that one could deal with. For instance, the emergence of Iran Alloy Steel Co was itself an "event," and a great event indeed, for our people. The history of the Alloy Steel Company goes back to the pre-Revolution era when, in 1972, Iran was to set up a plant for producing alloy steels of many types in collaboration with Corosolova Co of France on a site opposite the present location of Ahwaz Steel Complex. In fact in 1973 about 20 technicians and engineers were sent to France to gain know-how for alloy and special steels production, and receive practical training, over a period of 18 months. Later, in 1974, when Iran took over 25% of the shares of Germany's Krupp Co, it was decided that - since the Germans were better known in the field of the steel industry, particularly alloy steels - perhaps it was better for Iran to set up the alloy steel project in cooperation with Germany rather than France, particularly as the Ahwaz rolling mill, as the first Iranian rolling mill, and later the first steel-making plant using the electric arc furnaces, had been created in conjunction with German firms. For this, and perhaps other reasons, no immediate step was taken towards the creation of an alloy steel plant in Iran till 1979 when the Islamic Revolution came about, and was soon followed by the devastating war with Iraq. Consequently the whole project was forgotten for some time specially in Khouzistan, during those critical years of our history. Then, in 1980, Iran's Ten Top Revolutionary Projects were put forward by Iranian authorities, one of which was the alloy steel plant and from then on this project became an important aim of the Ministry of Mines & Metals, now known as the Ministry of Industries and Mines. When the UN Resolution was concluded in 1988, the Ministry of Industries & Mines insisted on developing the alloy steel project, as one of the ten essential Post-Revolution industrial projects. The tender documents for the basic design were prepared accordingly and were submitted to Voestalpine Co of Germany who formed a Consortium with Böhler of Austria, one of the top five companies of the world as regards alloy steel know-how and technology. The Consortium began the conceptual design of the project. 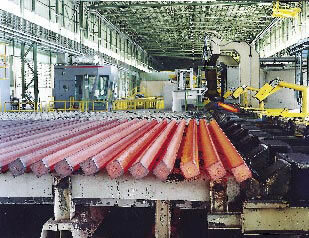 In 1992, the project was put forward as a tender for the supply and erection of the machinery and equipment for the plant, and Mitsubishi of Japan and Danieli of Italy were selected as the winners, and Danieli supplied us one the most advanced technologies available, and so the alloy steel industry of Iran began to take shape as a special "event" that most people concerned with Iran's industrial activities had considered a great desire, a dream. Today, it is an integrated complex consisting of a steel making plant, a heavy section mill, a light section mill, a heat-treatment and finishing plant, a plant for producing industrial gases (nitrogen, oxygen, argon...), and a full utility unit: all at the disposal of every Iranian industry, close to the city of Yazd, on a site that covers 400 hectares of land. It has a 25 km private road, a 16 km private railway line, and full HV electricity transfer facilities. It cost us 470m dollars in total at that time. The plant is surrounded by 150 hectares of greenery and parks in well-maintained condition, and a R&D and educational center that is unique among all the higher education centers of Iran. The center works closely with some of the top universities of the country as a program for consolidating the industry and the educational system as complementary systems. In the university they teach you theories, the results of which can only be observed in practice in industrial units. That's how they complement each other. This cooperation has had remarkable results. For instance, we have developed certain alloys through cooperation with Shiraz University, whose scientific knowledge had not been passed on to us by Böhler. This year we produced more than 5,000 tons of microalloy steels of vanadium, Bohr, and titanium which we distributed among our automotive companies such as Sapco, Saipa, Iran Khodro etc for use in the production of important parts such as pinions and gear boxes for Peugeot 206, and Peugeot 405. This item has justified and made up for the entire 470 million dollars invested in this project. Besides this particular item, our alloys are used extensively in many industries and manufacturing sectors: in automotives, aerospace, medical and dental surgery, oil and petrochemical power plant equipment, locomotives and rail wagons. 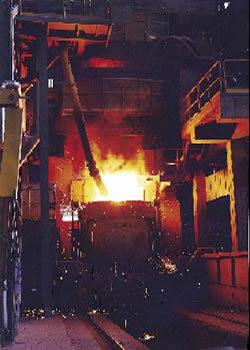 Many of our alloys have expanded in production very rapidly. For instance we began to produce alloys for making tools and parts for special purpose industries and already this year we expect to produce more than 160,000 tons. We are pleased that we have also been successful with our exports. 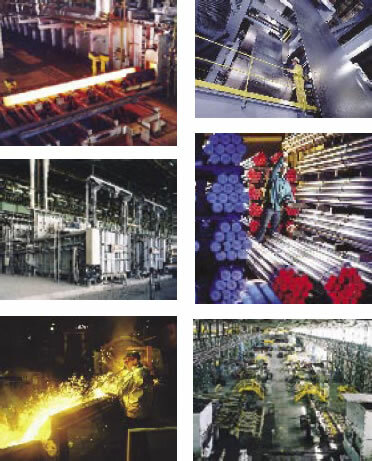 In 2001 (ending 20th March 2002) we exported only a small amount of alloys to UAE. In 2002 we exported 2,380 tons of alloy steels to Europe, Australia and Armenia. The last, being situated close to Russia and Ukraine, could easily procure its needs from those northern countries but preferred to buy from us, obviously because we offered certain advantages. Anyhow, this year we feel confident that our exports will exceed 13,000 tons, since we have already exported 8,000 tons and we still have over three more months to go (the Iranian year ends on 20th March). Also it is our pleasure that, because of competitive price and improved finished product quality, in the 23rd Conference on Alloy steels held in Switzerland we won a gold medal for quality and technology. And the International Marketing Organization has awarded us a gold medal for quality and services, and we also have received many other awards from other similar international organizations. This is not surprising nowadays because technical know-how and experience are no longer confined to a certain group of manufacturers. And today, buyers are not prepared to place an order unless they are sure of the capabilities and competence of the supplier. Furthermore, at present the production of alloy steels employs very sophisticated automatic machinery and equipment of high levels of automation such that, the whole process, from the beginning to the very end, cannot be seen from the outside of the closed production system/line. It was indeed an "event" when these machinery and equipment first arrived at IASCO from European first class suppliers such as Danieli of Italy, Demag and ABB of Germany, and Siemens, Lindeh and other famous companies. They are now opening many new gates to Iran's future industrial opportunities. Our machinery are highly up-to-date and fully automated. We have taken every precaution necessary to prevent harming the environment and have been awarded the Green Industry Tablet from our Environmental Protection Organization and we have the ISO 14001. We are currently having our internal audit being performed for OHSAS 18000. Furthermore, we have had the ISO 9000: year 2000 for quite some time now. And we have adopted the EFQM model for self-assessment, and we have been presenting the Tooba pattern for Business Excellence and our company continues to improve and, finally, we aim for total quality in everything we do. Most important of all we base our policies and activities on human dignity and respect, Islamic virtues, observance of the law, organizational discipline, and participation by everyone in running the affairs of the Company through TQM within the Tooba pattern. With all this and a great deal of efforts based on carefully worked out plans, we hope that our production complex will come to full fruition by 2005. Our vision is to be recognized as one of the world famous alloy and special steels producers. Based on our knowledge and technologies we also aim to be recognized as an important supplier of special engineering steels for other highly stressed applications characterized by high demands on quality.